Beth Ditto has an icy, trilling prowess. Wooing and coaxing, jarring and brassy. A succulent, orgasmic voice that swirls high wails against raspy lows backed by Brace Paine's burly guitar and dance-ready, thumping drumbeats from Hannah Blilie. They call this Gossip. 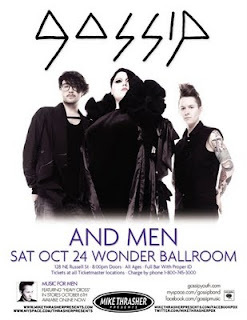 But it's no secret that it's coming to the Wonder on Saturday, October 24th. Beth, a self-proclaimed "fat, feminist lesbian from Arkansas," and her crew call the NW home but are tromping around the world with their circus show. Ms. Ditto's presence is immense in more ways than one with shrieks stacked on top of her already feral stage show known for disappearing garments and wild bouts of agitation. Touring in support of their fourth album Music for Men, released this June, the kids finish off the west coast this month before colliding with sweet Paris. Bending gender with delightfully outspoken lyrics and intermixing synths into their dance-punk formula, Beth's passionate voice sends chills down your spine as she gracefully bawls. Behind the kicking dance beats, this babe can belt it out with the best.